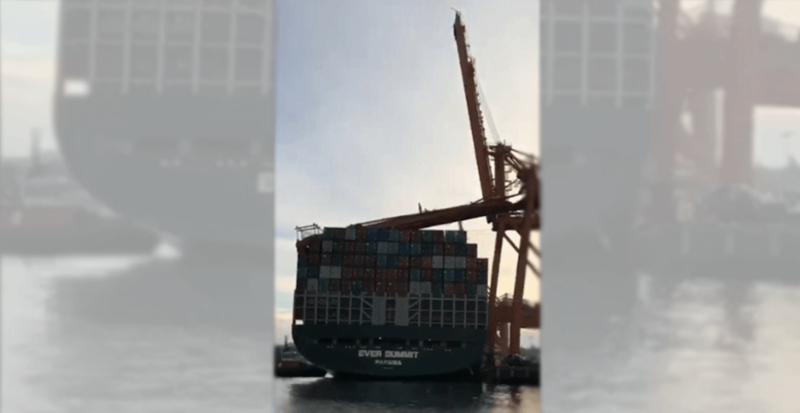 The container ship that was struck by a ship-to-shore crane boom at Global Container Terminal (GCT) Vanterm should be able to leave the Port of Vancouver by Thursday. MV Ever Summit has been held at a berth at Vanterm since the early morning hours of January 28, when the ship’s contact with the crane allegedly caused it to collapse onto the containers stacked on the ship deck. In a statement to Daily Hive, GCT spokesperson Louanne Wong said work is progressing on freeing the vessel from the berth and returning terminal operations to normal. “The impacted ship-to-shore crane boom was removed from the vessel this morning,” said Wong. Full vessel operations resumed late this afternoon, and it is expected that the vessel will be able to leave the Port of Vancouver to travel to its next port-of-call early Thursday afternoon. Federal safety investigators were deployed to the terminal last week to determine the cause of the incident.